Did you know that, when it begins to rain, the first 10 minutes are the most dangerous on the road? In dry weather, roads accumulate a thin layer of oil deposited from passing vehicles. When rain begins, the road’s surface becomes greasy and slippery when the oil combines with raindrops. When you have been hurt in a car crash, we are McKinney car accident lawyers and we’ll get your life back. Turn on headlights and wipers. Allow more room between your car and the vehicle you are following because you’ll need more braking room. Avoid hard braking and sharp turns. If you have been in a hydroplaning situation, you know how scary it can be to lose control of your vehicle. Hydroplaning can occur in any depth of water on a road. When the water in front of the tires builds up faster than the weight of the car is able to disperse it, a thin water layer is forced under the tires. The tires can’t get any traction and so won’t respond to steering and the brakes won’t respond either. If you feel your car hydroplaning, take your foot off the accelerator immediately to give the tires a chance to get in contact with the road. Try light braking if you have anti-lock brakes. Keep steering in the direction that you want the car to go. 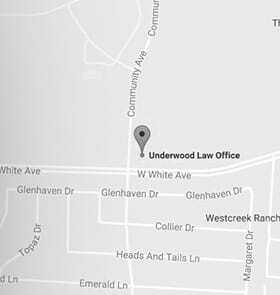 For more information on McKinney car accident lawyers, call us toll free at 844.UNDERWOOD.